This page is intended to give a broad introduction to Encore Learning, its mission and operations in the form of some extended answers to often asked questions. Q. Is Encore Learning open only to Arlington residents? A. No. Encore Learning membership is open to anyone in the Washington, DC, area who is age 50 or over. Q. How do I join Encore Learning online? Note: If you have ever been a member of either Encore Learning or Arlington Learning in Retirement Institute, please use Renew Membership. Q. How do I renew my Encore Learning membership online? A. Go to Renew Membership. TIP: The mailing label on your catalog includes your membership expiration date. Q. What happens if the course I want to take is full? A. You may choose to join the course’s wait list; no deposit is required. You will be notified if space becomes available. Q. What happens if my course is cancelled? A. If your course is cancelled, Encore Learning will contact you within the week before its start date. You have the option of switching into another open course or receiving a refund for the course. Q. When can I speak to someone at the Encore Learning office? A. Encore Learning maintains an office at the Syphax Education Center (SEC), located in the Sequoia Plaza #2 at 2110 Washington Boulevard. Staff can be reached by email at Info@EncoreLearning.net or by calling 703-228-2144. During most of the year, the SEC office is staffed from 10am to 2pm, Monday through Friday. Summer hours are posted on our calendar. Q. How do I suggest a possible instructor? A. The Academic Programs Committee plans the courses. Send suggestions of possible instructors with their contact information to the Academic Programs Committee at Encore Learning, 2110 Washington Blvd., Arlington, VA 22204 or email Info@EncoreLearning.net. Q. 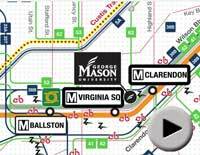 Parking around the SEC and GMU-Arlington Campus can be difficult. Do you have any suggestions? A. There is free parking in the garage adjacent to the SEC building. Encore Learning members using the parking garage at the SEC should follow signs for Visitors to the 2100 building. Street parking at meters and limited-time zoned parking on adjacent streets are available at GMU-Arlington Campus. In addition to metered street parking, hourly public parking is available in GMU-Arlington Campus Founders Hall garage. The entrance to the Founders Hall garage is on N. Kirkwood Road between Washington Boulevard and Fairfax Drive.